This Southern peach cobbler is going to bring back a lot of memories. Plenty of butter, juicy, ripe peaches, milk, and vanilla make this a rich, luscious dessert few will be able to resist. Call it Southern charm. This old-fashioned Southern classic has all the charm of a Southern belle. As tradition in the South holds, sweet oftentimes mean really sweet, which many of here quite like. If that’s not your cup of sweet tea (so to speak), feel free not to add the full amount of sugar, especially if your peaches are exceptionally ripe. Regardless of how much sugar you add, you’ll be mesmerized by how the cobbler topping becomes transcendent and rises to the top of the filling while baking. Again, that Southern charm. 1. Preheat the oven to 375°F (190°C). Line a rimmed baking sheet with aluminum foil. 2. Plop the stick of butter in a 9-by-9-by 2-inch (23-by-23-by-5 cm) square baking dish or a 9-inch deep-dish pie plate or a 10-by-2-inch (25-by-5 cm) round casserole pan and place it in the preheating oven just until the butter melts. You may want to let the oven door slightly ajar (even if it is summer) so you don’t forget about the butter and let it burn. 3. In a large bowl, gently toss the peaches and 1 cup sugar and let it rest while you prepare the cobbler batter until the peaches release some of their juices. 4. In a medium bowl, sift together the remaining 1 cup sugar, the flour, baking powder, and a pinch of salt. Add the milk and vanilla and stir just until combined. Pour the batter over the melted butter but do not stir. 5. Spoon the peaches and their juices carefully on top of the batter without stirring or otherwise disrupting the batter. Place the baking dish or pie plate on the lined baking sheet. Bake until the cobbler topping rises to the surface and is golden brown and bubbly, 40 to 45 minutes. 6. Serve warm or cold, topped with ice cream or whipped cream, if desired. Southern Peach Cobbler Recipe © Beth Price. Photo © Beth Price. All rights reserved. All recipes and photos used with permission of the publisher. I made the recipe with whole milk and did not add any salt. My batter was a very thin batter and I wasn't sure exactly what it was supposed to be so I just kept on pouring it into the baking dish. It worked, so it must not have been too far off the mark! I've made this Southern peach cobbler, or a variation of it, for years. It's so simple, foolproof, and easy to throw together at the last minute. It's not a traditional biscuit-type cobbler, but rather a more cake-y dessert. In a pinch I've used canned or prepared pie filling. All you need is vanilla ice cream. It's also good for breakfast (leftovers, if you have any!). This Southern peach cobbler truly brought me back to my grandmother's kitchen. Her homemade peach cobbler is one of a couple desserts I remember most from growing up. I love the way you build this cobbler from “the bottom up.” Melting the butter in the baking dish, pouring the perfect crust batter over that, and then the grand finale of fresh, sliced peaches. After exactly 45 minutes of baking, the crust had risen to the top of the baking dish and nestled itself around the peaches. It was barely starting to brown on the top so the crust was cooked but just the right amount to where it was still tender. I used less sugar overall because the peaches I had were on the sweet side--I used only 1/4 cup on the peaches and 1/2 cup in the batter. I bet this recipe would work well with many other fruits as well--apples, berries, you name it. But I think peach is and always will be the best choice of fruits for the cobbler. Thanks for sharing this recipe. It goes down as a classic in my recipe folder...along with a dollop of vanilla ice cream, of course. I can tell how good a recipe is, especially a fruit cobbler, by how many times I go back after eating a portion to pull a few more forkfuls from the cut edges—in this case, edges that were seeping with cooling fruit and juices. Yes, it's that good. And ridiculously easy. Though I started with a large bag of peaches, the caregiver must have been slicing some for my mother because I didn't have enough for 4 cups! So, I did 2 1/2 cups sliced peaches and a 1/2 cup blueberries. However, I used full portions of everything else except the sugar; I just used 1 cup, divided, because I had a mix of ripe and less ripe peaches and sweet blueberries and don't like overly sweet cobblers. I also used whole milk, not a mixture, and so added a dash of salt, as suggested. Even with a full batter recipe, the butter appeared to overwhelm the mixture. We tasted portions with whipped cream while the dessert was still fairly hot because we couldn't wait. Though delicious, I wonder if a half stick of butter would work. This Southern peach cobbler is delicious! The recipe is so simple and trouble-free I was concerned it was not going to work. It only took 3 large peaches to get 4 cups of sliced fruit. I used 1/4 cup heavy cream to 3/4 cup coconut or almond milk. While layering the initial ingredients, I resisted the urge to stir. It produced a golden brown, crunchy, chewy, gooey, peachy dessert. It is so delightful it didn’t even need ice cream or whipped cream. This Southern peach cobbler sure was a snap to make. My peaches were ripe so I added a little less sugar and I used whole milk but I think if I make this again I would make it richer by adding the half and half. Served it right out of the oven, just to myself, HOT but still good, no ice cream not because I didn't have any and I wanted to try the natural flavors of the peaches. A not-too-rich dessert. This is one of the best peach cobblers I've made in a long while. I used half a bushel (about 12) of fresh peaches from our local farm because they were on the slightly smaller size. If you used larger peaches I would suggest using about 8. If you are like me, who is not the best at baking (or simply lack a patience for it!) yet want to impress your family and friends, this is a perfect recipe for you. I ended up buying too many peaches (which now I am glad about as I am already doing a second cobbler). I ended up using 5 peaches. As I was looking for sugar, I realized I had none, so I ended up using confectioners’ sugar and decided to only use 3/4 cup for the peaches and the same for the batter. Also, as I was adding the milk, I realized I only had a tiny amount of 1% milk so ended up using a blend of 1% milk, heavy cream, and soy milk. As I did not have a 9-inch pan I used a typical round 10-inch pie dish. Everything took about 10 minutes to prepare which is the perfect amount for my baking patience! And 40 minutes was perfect timing. I ended up bring the cobbler to a kids’ party and we all enjoyed it with some vanilla ice cream. So after all these mishaps I can say that this recipe is not only easy to make as works even with a few mistakes in the midst of it! This is a recipe to repeat (doing it right now, but this time adding a few drops of port wine to the peaches, too). I did like this Southern peach cobbler. It was super simple and it is a recipe that can be made on the fly when you need to throw together something sweet in a pinch. I think it could stand a little lemon juice and zest just to give it that extra oomph. There was one thing. If you are into textures, this cobbler after a day or so gets kind of soft and so for those who don't like "mushy," this recipe could be a problem. Eat it all on the first day! It's good enough to do so! I made this with 5 peaches and a handful of blueberries. I used 2% milk, since that’s what I had in the house. And I’m glad I baked it on a foil-covered quarter sheet pan because I would have been cleaning the inside of the toaster oven for sure, thanks to my slightly-too-small glass pan. This was super-easy. It was also good, although I thought the cakey part was a bit too sweet. I agree with Tammori Petty’s assessment that a little lemon juice in the filling would be a welcome addition. With really good seasonal fruit, I’d probably cut the amount of sugar that gets mixed in with the fruit in half, and I think you could also knock about a third to a half off the amount of sugar that goes into the batter, especially if you’re going to eat it all on the first day. Fortunately, peach season has just begun around here. Hi Melissa, I’m so happy that you tried the peach cobbler. The beauty of this recipe is that you can adjust it to your personal taste. Enjoy! Well, now you have done it. Here in Santa Fe, we get fresh peaches starting in July from the Western slope of the Rockies. I buy my peaches from Margurite, the peach lady who hauls them in fresh every week from Colorado. I had a few on hand and decided to make this cobbler for a friend’s birthday with my sour cream and vanilla ice cream as a topping. I did not mess with this recipe as I sometimes do. It is perfect and I made it twice again after that. It is so easy I can make it on a whim. And I was doing so well on my diet. Living in the Pacific Northwest, no one here has ever seen or tasted this classic southern version of cobbler. Everyone seems to think that fruity-biscuity thing is a cobbler. What a shame! My mama was from the deep south and she made sure we were raised on good southern cooking. This recipe is a family favorite, using practically every version of fruit out there. Being surrounded by wild blackberries, my go-to fruit for this cobbler is blackberry. 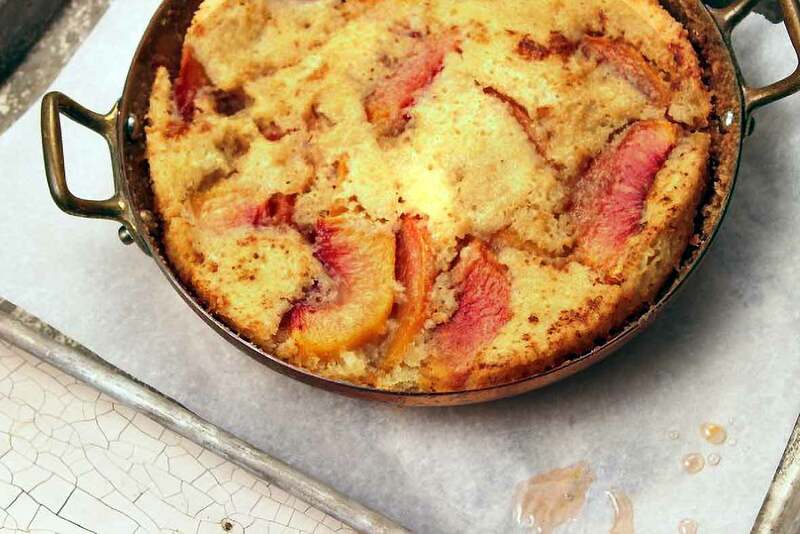 But, during the dead-days of winter, especially in February when we’ve had rain, snow, sleet, and general overcast and haven’t seen sunshine in 40 days, this cobbler using peaches is like a bright burst of summer in your mouth- unbelievable! – Add 1 tsp. cinnamon and a dash of nutmeg to the flour mix. – Add juice of half lemon to berries while macerating in the sugar. – Changing the milk to 2% Lactose-free milk. We all have problems with lactose intolerance- reducing the amount of butter and changing over to lactose-free milk ensures we can eat endless quantities (or until the cobbler runs out). Love your tips, Claire, thank you so much! I’ve also used almond milk in place of regular milk and it works great for those with lactose issues. It is interesting that most people refer back to the memory of their grandmothers making this kind of dessert. I think in the old days the amount of sugar would have been OK – also the lack of salt – but next time I make this I will halve the sugar and I did add 1/2 a teaspoon of salt but might increase it to 3/4 teaspoon. After 6 minutes in the oven the batter was boiling over the edge of the dish, but I had a sheet pan underneath to catch any drips. I had to change the sheet pan with one lined with foil as so much batter boiled over. Maybe I needed a bigger dish, though I did measure 9-inches. I would definitely add lemon zest, as any more liquid would have increased the overflow!! Hi Serena, wow, I am so sorry that you had an issue with overflowing batter. You were so wise to have a sheet pan at the ready. I usually use a pyrex dish to make this, how deep was your pan? Doubled the recipe, did not even make it to adding ice cream, it was rated by 5 people who love, love peach cobblers as the best they have ever had. Should have taken a picture, it was a lot but disappeared in less than 24 hrs. Thank you for the recipe, it will now be the only one that I will make. Thank you Elena, you made my day with your lovely comments! Peach cobbler deliciousness!! I usually make crisps and thought I would venture into cobbler baking. Boy, am I glad I found this recipe…and so is my family. I think my favorite part was the crunchy edge parts! I made it as written and even remembered the drip tray. Wouldn’t change a thing. Love this, Heather! I made a cobbler over the weekend and found myself doing the same thing, nibbling all those outside edges.